It seemed like tradition that terrible weather would accompanies the R & B season opener, but 2014 finally broke that pattern. But despite the nice weather, the fishing was traditionally tough. 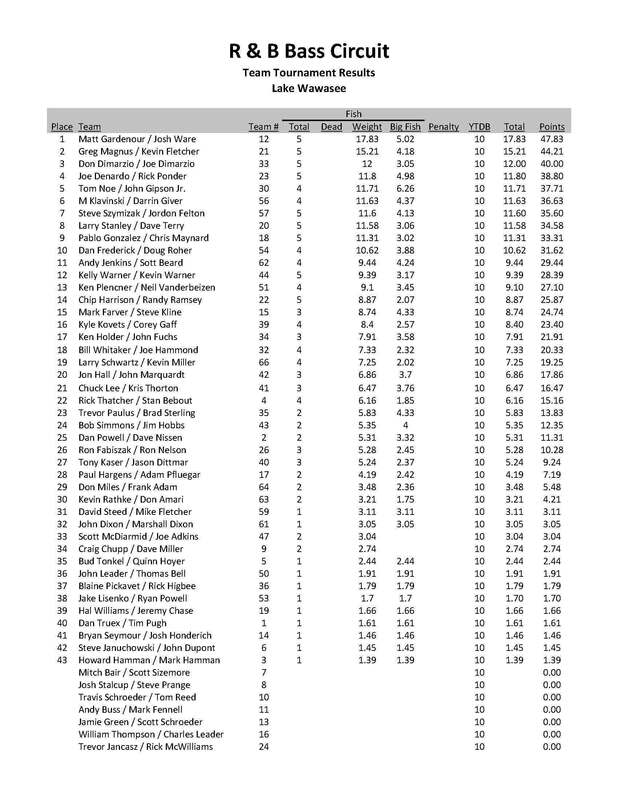 Proof of that was out of the 66 teams, only 9 weighed their five fish limit. 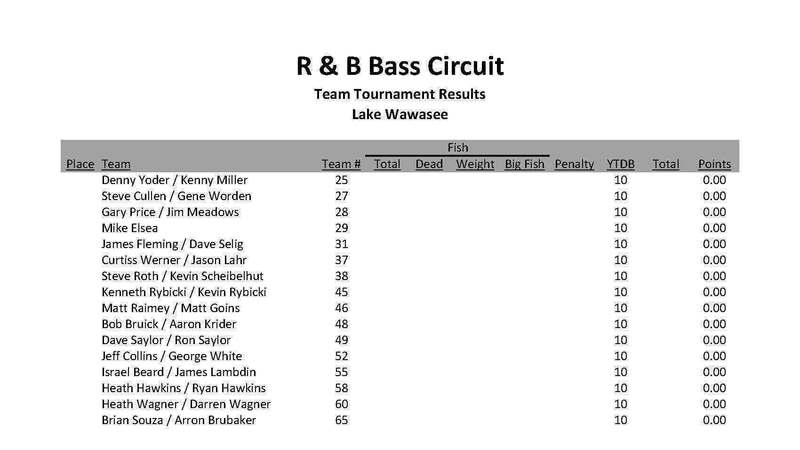 The 66 teams set an attendance record for an R & B Bass Circuit tournament. The success of the circuit is a direct result from the people who donate their time. Please express your gratitude to them as they receive no pay or compensation for volunteering; in alphabetical order: Mitch Bair, Craig Chupp, John DuPont, Steve Januchowski, Dave Miller, Steve Prange, Tom Reed, Travis Schroeder, Bryan Seymour, and Josh Stalcup. At first it appeared that way. 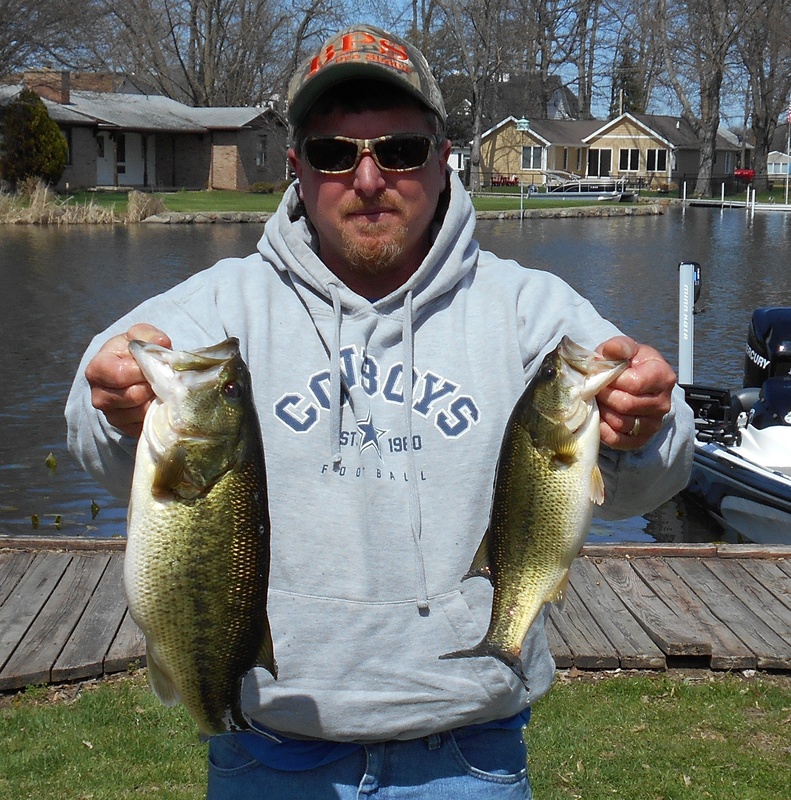 Using a variety of reaction baits, they had boated four 14 inch keepers by 10:30, and then, things got better. After slinging a jig in the middle of the channel, a 5.02 pound largemouth bit. For the next 90 minutes, they caught 10 more keepers and were able to cull up to 17.83 pounds. That big fish was the second heaviest of the tournament and won them $132. Their limit was complete at 1:00, and they failed to catch another fish after that point, “It was light someone hit the switch,” said Ware. The victory won them $983 making their total winnings $1,122. As good as the day ended up being for the winners, it could have been better. Lining up with the incentive programs by Solar Bat Sunglasses and Lock-n-Haul Transom Saver could have won them an additional $300. In addition, if they were riding in the right Nitro Boat, they would have earned another $3,000! 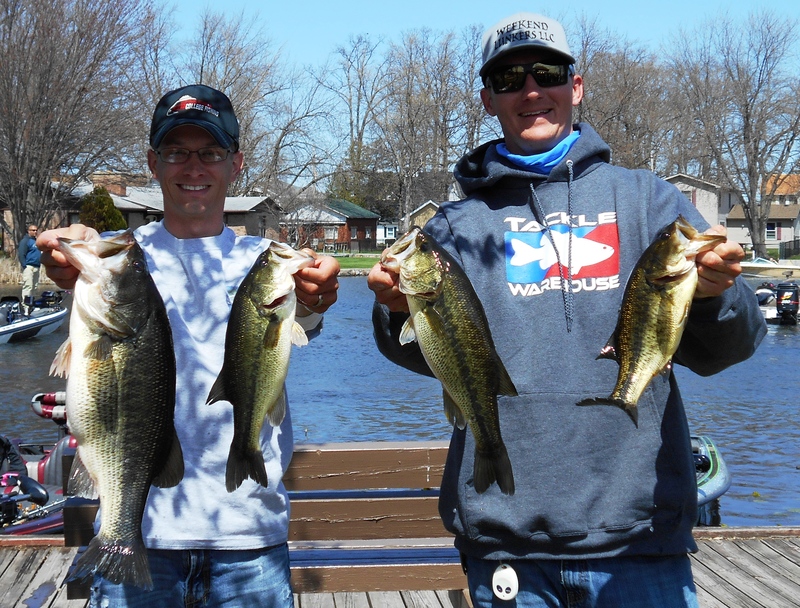 2nd Place: After sorting through 20 keepers, the 2013 Season ChampionsGreg Mangus and Kevin Fletcher landed their seventh Top 5 finish in the last eight tournaments with a 15.21 pound limit. Their 13 Top 5 finishes is six more than the next closest team in that category. They caught fish on Poor Boy’s Erie Darters, jigs, and jerkbaits, but most of their better fish were tricked by a spider grub. Mangus says, “Four of the five we weighed came from the spider grub, but our biggest (a 4.18 pound largemouth) bit the Darter. However, no doubt, the spider grub was the deal that day.” The spider grub was matched up with a 3/16 ounce Bite Me Sparkie Spider Grub Jig on 8 pound line. On top of holding the record of Top 5 finishes, they also boosted their lead in the All Time Money Winners list by adding another $632. They discovered this honey hole at 10:30. Here they went on to catch 11 more keepers. While a few fish came on homemade green pumpkin jigs, the majority fell for a Poor Boy’s Erie Darter rigged with a ⅜ ounce Bite Me Kimmie’s Jig. This was the team’s first R & B tournament, and if this is a sign of the future, R & B veterans had better take notice. Along with the high finish, they pocketed $456. 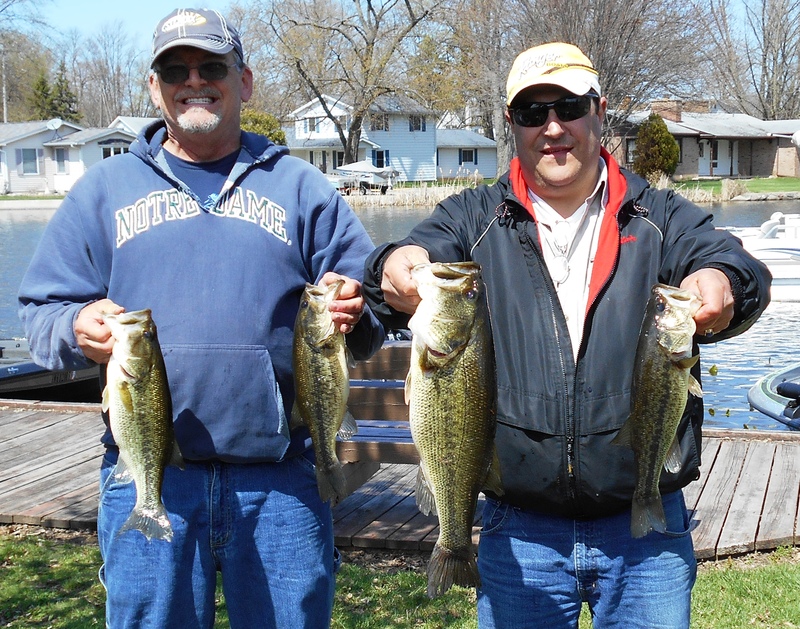 4th Place: Rick Ponder and Joe DeNardo, owner of Joe Bass Lures, won the first ever R & B tournament on Winona Lake in 2010. Their big fish and sack from that day still rank among the highest in History. Admittedly, the team has struggled with consistency; however, it appears they are now onto something special. Going back to the last year’s classic, they have now cashed two times in a row and show no signs of slowing down. 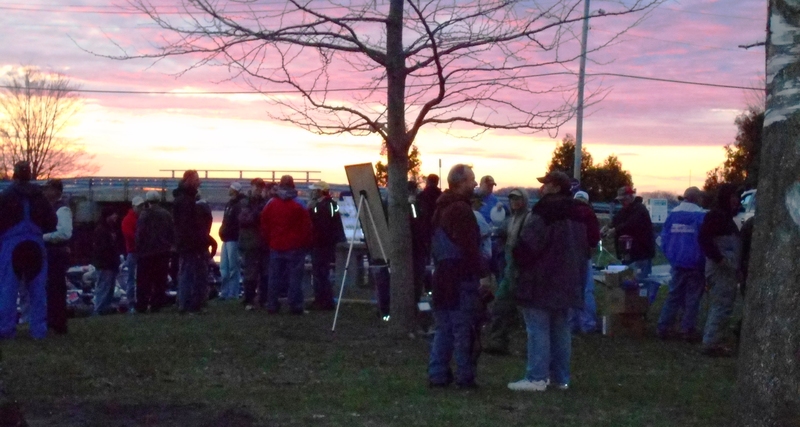 boat draw (#10), we were confident to start in a channel we knew held some fish,” explains DeNardo. “It was the darkest water we could find.” They never lost a fish, including, amazingly, one of the same fish from practice, “We had a fish with just one eye, and we caught him in practice too!” DeNardo exclaims. Experience has taught the team that in colder water, pork trailers work better than plastic, “It has a better fall than plastic,” explains DeNardo. Their limit was anchored by a 4.98 pound bruiser. Initially DeNardo thought he had snagged a lily pad, “I snapped my rod to break it loose, but then it fought back. I told Ricky ‘Ain’t no way it’s a bass; probably a carp.’” That hawg and an 11.80 pound limit won them $316. 5th Place & Money Mouth Baits Big Bass: The most spectacular sight of the weigh in was provided by John Gipson, Jr. and Tom Noe. 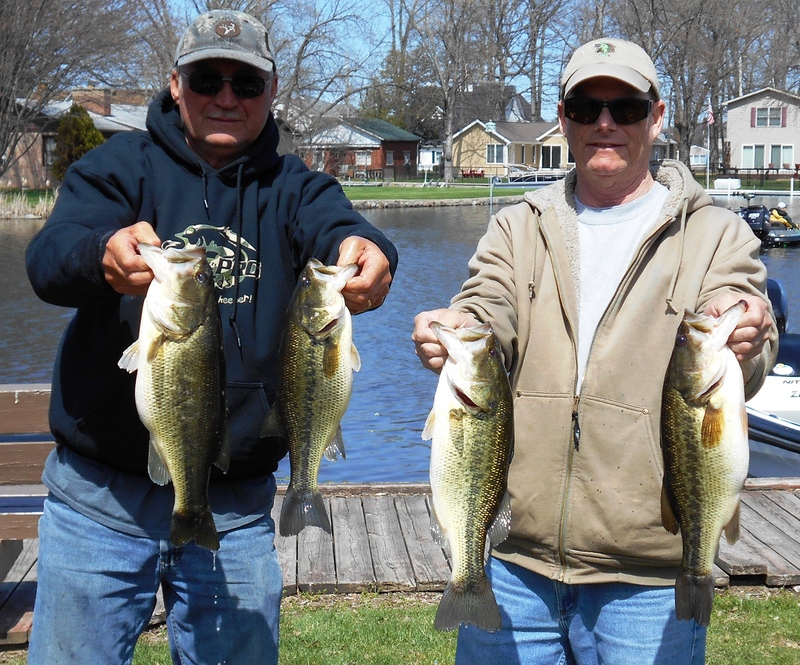 Their 6.26 pound Money Mouth Baits Big Bass was a sight to behold. This also ranks as the second heaviest fish weighed in R & B History. Interestingly, it too fell victim to a Max Jig, but in the green pumpkin pattern. However, the day began painfully slow. took some time to figure it out, but once we slowed down, we began getting bit.” In fact, it was not until they soaked the Max Jig did they begin catching fish. 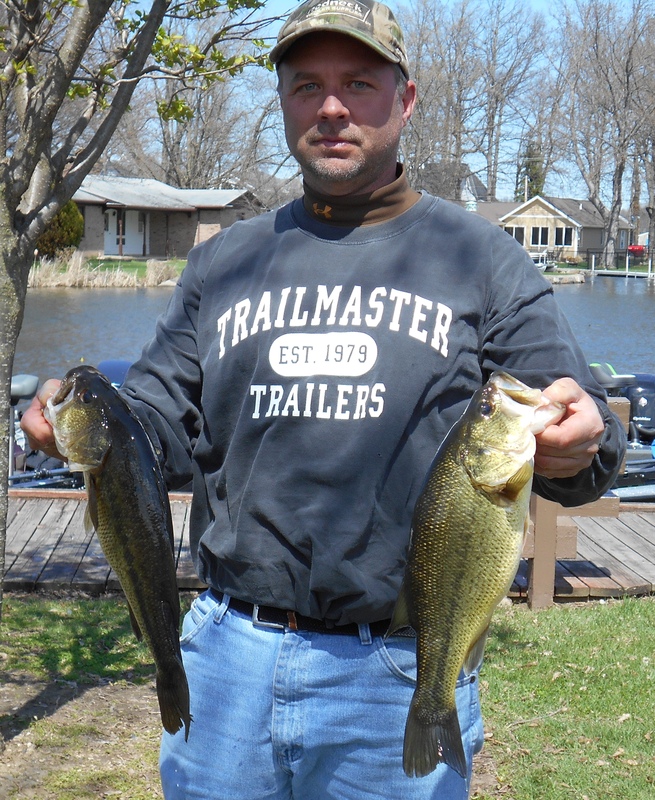 Two fish, including the big one, came from soaking the bait in the mouths of channels, but they also landed two off of spawning beds. The four fish weighed 11.71 pounds and won them $281, but the big fish also earned them an additional $528, making their total $809. 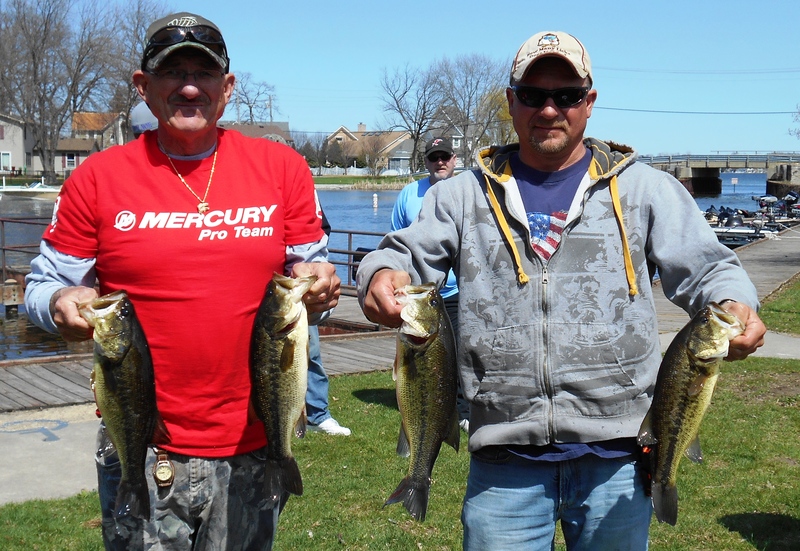 8th Place: An 11.58 pound limit won Larry Stanley and Dave Terry (left) $158. 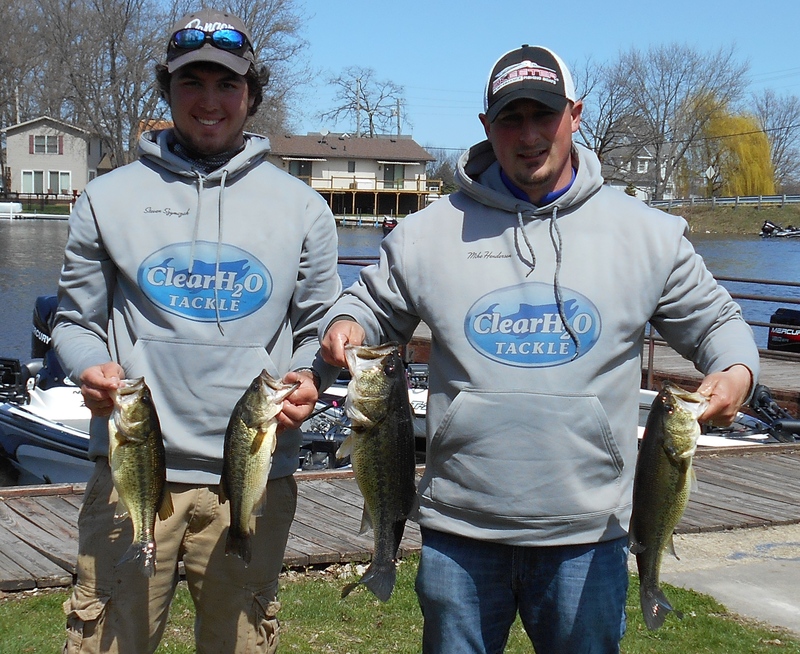 9th Place:Pablo Gonzalez and Chris Maynard (right) landed an 11.31 pound limit to carry home $123. 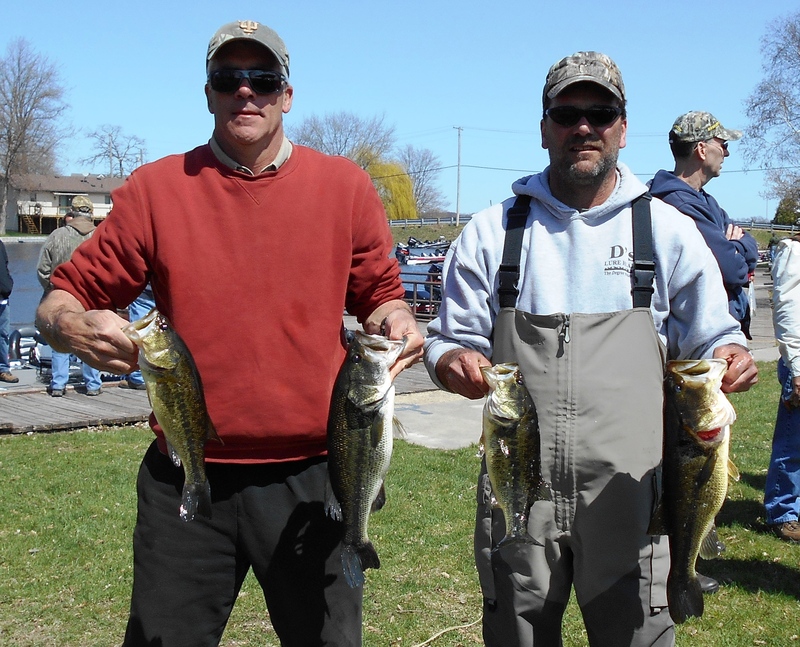 10th Place: Veteran anglers Dan Frederick and Doug Roher (left) landed 10.62 pounds and took home $105. 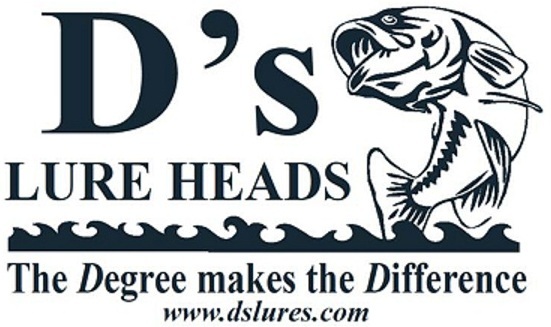 D's Lures Award: Finishing 11th place with 9.44 pounds, Andy Jenkins (right) and Scott Beard won a tackle pack and t-shirts. 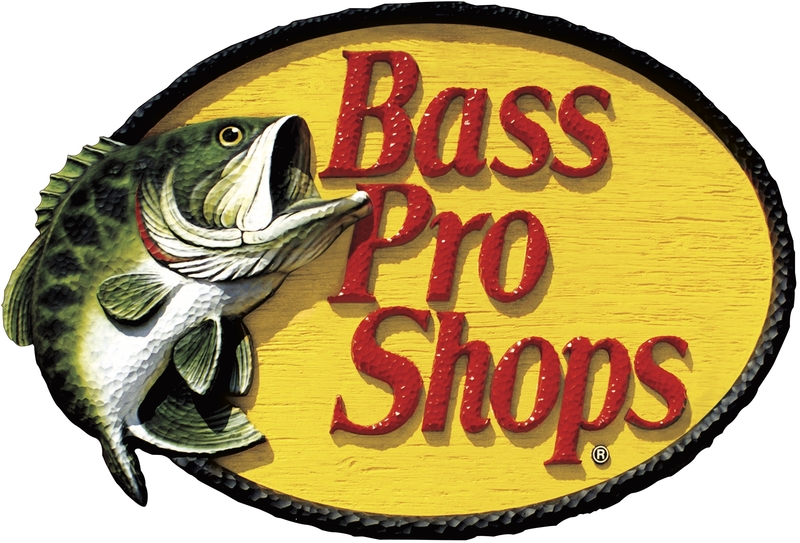 Bass Pro Shops Award:Steve Kline and Mark Farver finished 15th place with 8.741 pounds and won an Extreme reel provided by the BPS store in Portage, Indiana. Solar Bat Sunglasses Incentive: Finishing in 20th place with 6.86 pounds, Jon Hall and John Marquardt qualified for the Solar Bat Incentive worth $200 in cash. Make sure you are qualified! Starboard Choice Marine Challenge: With 6.16 pounds and a 22nd place finish, Rick Thatcher and Stan Bebout are eligible for a prize worth $90. Click below for a .pdf file. 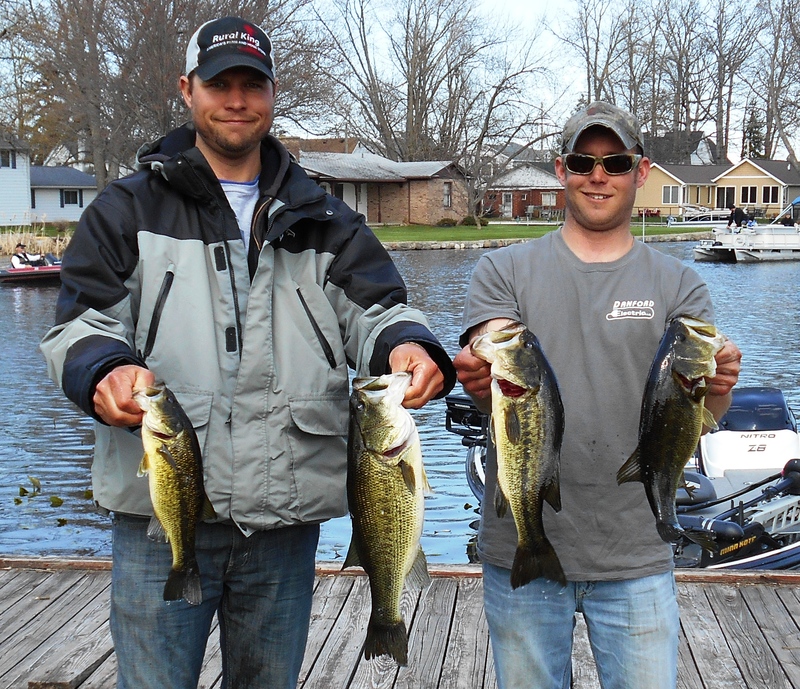 6th Place: Four fish that weighed 11.63 pounds won Darwin Griva and Mike Klavinski (left) $246. 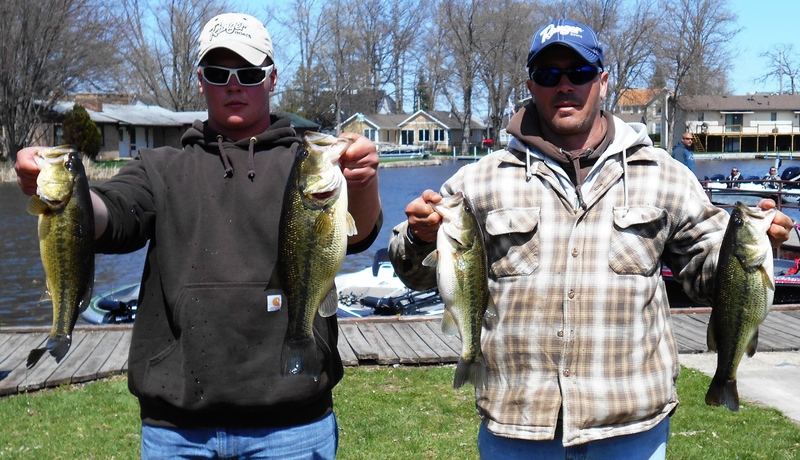 7th Place:Steve Sczymzak and substitute partner Mike Henderson (right) bagged an 11.6 pound limit to take home $211.